I haven't blogged about this before, but movie rights for my first picture book, THE DEVIL YOU KNOW were optioned back in 2007 by Fox, with Shawn Levy, director of NIGHT AT THE MUSEUM in the producer's seat. It was all very exciting. Shawn Levy even called me to say congratulations. Wild huh? "The Devil You Know is based on a children’s book by Nathan Hale, about an American family that buys this house in Galway and it’s got this horrifying little goblin that lives in it. They hire this Irish nanny, a kind of fairy godmother, and it turns out she’s much much worse than the goblin — hence the title." This is my first peek into how they are approaching the story (sounds fun!) I wish I could be a fly on the wall and hear all the screenwriting ideas. I'm always interested to see what movie studios do to turn a 32 page picture book into a full length movie. The Ireland angle is something I didn't expect, but it makes sense. I'll let you know if I find any more news. I wish I were a better blogger. My blogging hero is James Gurney, the great illustrator/author of the DINOTOPIA books. His blog is called Gurney Journey and he posts on it nearly every day. The posts are always interesting tips and facts about academic painting. Honestly, I have no idea how he gets anything else done, his blog could be a full time job--that's how good it is. RAPUNZEL is Nom-nom-nominated for an EISNER! 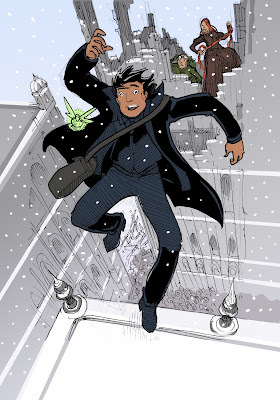 Big news everyone, RAPUNZEL'S REVENGE just got nominated for an EISNER Award! 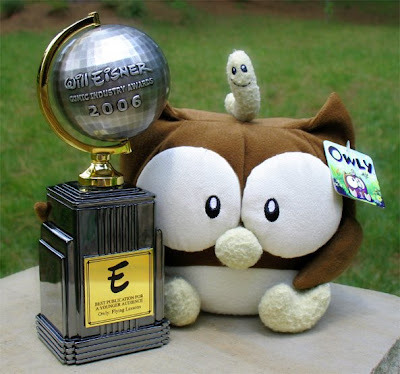 Eisner Award modeled here by 2006 Winner OWLY--if you haven't checked out OWLY and you have very young readers, go to Amazon NOW and buy it. Adorable! The awards will be announced in July at Comic-Con--so you guessed it, we're going to Comic-Con! I'll make sure to shoot a lot of photos for the blog. Great news! 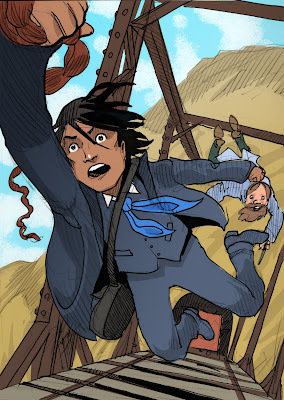 And to the nomination committee and Eisner Judges, THANK YOU! 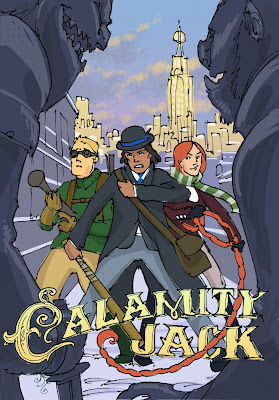 I'm now painting the cover for Calamity Jack. It should be finished tomorrow, and while I can't show you what the final cover will look like, I can show you some cover concepts that weren't chosen. These are all quick color sketches. This is the only one that actually had the title sketched in. 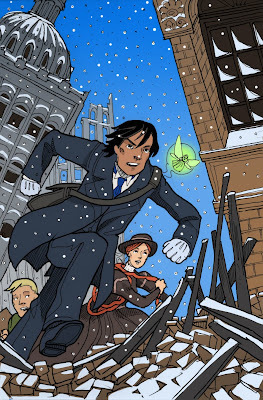 The theme is fairly similar, Jack, Rapunzel, a guy with goggles and a flying green dress in a snowy, crumbling city-scape. 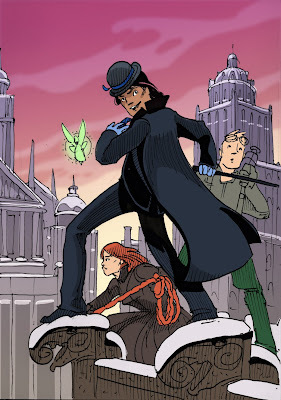 This pose is really goofy, but I like the perspective on the buildings below. This one's a little different, just showing Jack and a random dwarf character on some kind of train-track contraption.